As you may be aware, a recent news story regarding information found in Iraq on U.S. schools mentioned Salem, Oregon. I want to take a moment to share further details about this situation. First of all, there was no threat made against our district or schools. We have not received any information that directly said or even implied that there was a threat against our local schools. Salem-Keizer reviewed all of their security and emergency plans, something that they do every fall. KEX further reported that information from Homeland Security now indicates that there was no connection between the owner of the laptop found and either Iraqi insurgents or al Qaeda operatives. A Finnish commuter ferry captain has been suspended after forgetting to turn off the autopilot and crashing into a pier — twice. I can understand once. But twice? After running the same route for 10 years, last Tuesday he for some reason forgot that the autopilot was engaged. Two passengers and one crew member were injured when the ferry crashed into the pier. He was given a dressing down by the ferry company. But he was also given a second chance. Back he went to his usual route. On Thursday, forgetting again that the autopilot was engaged, he headed for the same stop. This time nobody was injured, but the pier was totally demolished. He was not drinking on either occasion. But the ferry company was unable to say when, or if, he would be returning to his job. I think they’ll have to rebuild the pier first. 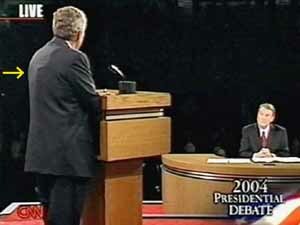 Bush gets a little debate help? Apparently Bush had a radio receiver fastened to his back during the first debate so he could receive messages (see the bulge marked by the arrow). Perhaps this is why his campaign insisted on a “no camera shots from the back” rule? Perhaps this is why sometimes he stumbled over his words? I know he does that anyway, but it seemed worse than usual. It will be interesting to see how tonight’s debate goes. Since the candidates can get up and walk around the stage, it will be harder to hide a receiver. I notice that the Electoral Vote Predictor in the side blog is projecting Kerry-280/Bush-239. This is the first time for a long time that Kerry has had enough electoral votes to win. I think it’s still a pretty tight horse race. Tonight’s debate is important to both candidates. I’ve been meaning to blog about why keeping the electoral college is important. Maybe I will this afternoon if I feel better. Hussein and who is not?